Explore Irwin’s finest restaurants and shops! See what great events are happening in our great town of Irwin! Read exactly what’s going on locally around Irwin! Welcome to Downtown Irwin! Downtown Irwin is a quaint, traditional small town with a variety of attractions for everyone. Come to Irwin to shop, dine, do business, or just pamper yourself. Irwin is home to many unique specialty shops, salons and boutiques for self indulgence and quality dining to complete your downtown experience. Come be a part of “One Great American Small Town” – Downtown Irwin. 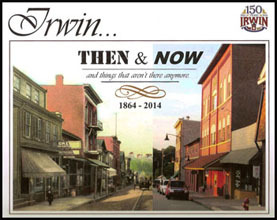 This book presents a visual record of the images of what Irwin, Pennsylvania looked like when it was young, as compared to what it looks like in 2014. In another 150 years, it will have again changed in ways that we can only imagine.